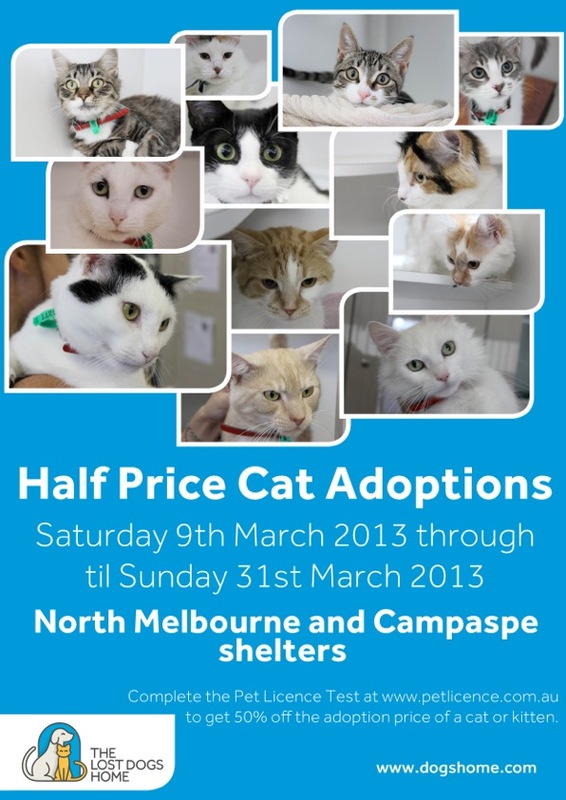 As cat owners will attest, there is no therapy like the purring of a contented cat on your lap, the loving swoosh around your legs and the hum of a contented purr on your bed, and with our half price adoption special there is no better time to adopt. “We hope that anyone who has been considering welcoming a cat into their lives will take advantage of the fifty percent discount and come and visit our many cats and kittens awaiting adoption,” said manager of operations, Sue Conroy. “With so many to choose from there is bound to be a cat or kitten to suit everyone, in particular we would like to see some of our long term and very worthy residents adopted into new homes. The long weekend is the perfect opportunity to welcome a new feline friend into your life, with an extra day to spend quality time getting to know each other.” added Sue. At our North Melbourne Shelter, our brand new cat adoption centre provides a welcoming and light space to meet and get to know the cats. It also offers a much more comfortable environment for our cats awaiting new homes, however the very best therapy they can receive is to be someone’s beloved companion in a caring home. We urge anyone considering the personable and therapeutic companionship of a cat to visit our North Melbourne and Campaspe Shelter in Echuca to adopt. However, to make sure people fully considered their responsibilities as cat owners, they are required to complete our online Pet Licence to be able to take advantage of the half price promotion. To save on time, we advise you complete the online version of our pet licence test prior to visiting The Lost Dogs’ Home, however, just in case there will also be tests available at both shelters. “The Pet Licence is our way of ensuring people know exactly what they are committing to when they adopt an animal,” said Sue. “It covers dietary requirements, the cost of veterinary care and the need for socialisation and playtime, and everything else in between. All our cats and kittens are desexed, microchipped, vaccinated and have had a health check prior to going up for adoption. To see which one might be the right one for you, please visit our adoptions page.